Tally ho! If you remember back in December we launched an Indiegogo campaign to help raise funds for a London showcase for this spring. Well the time has finally arrived and we are proud to present the final product of a long journey of planning. 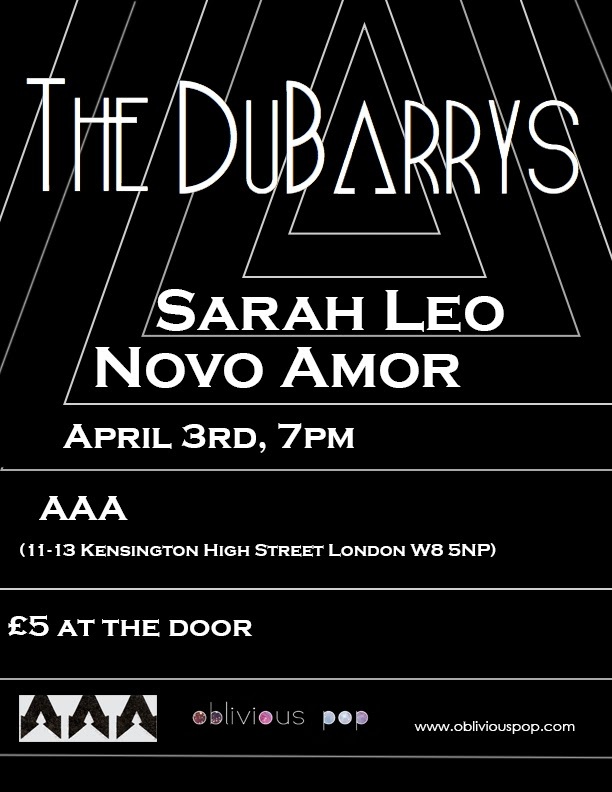 We bring to you, on April 3rd at AAA in London, The Dubarrys with Sarah Leo and Novo Amor. This lineup is packed full with some names you're gonna want to be watching in the coming year. The Dubarrys, hot off of one of our favorites tracks "This Time", are finalizing their upcoming debut EP that's sure going to launch them into your favorite indie rock band of 2014. Sarah Leo will get your heart pumping with her sultry sounds, and Novo Amor will pull on your heart strings with his powering lyrics. It all goes down April 3rd. Tickets at £5 at the door and you're not going to want to miss this! Come out and have a drink and listen to some of the best upcoming acts of 2014.